Friends and brethren came together to celebrate with John MacDonald of Normoss Round Table Lodge No 8741, his 60 years in the Craft. Alan Berwick opened the lodge and quickly dispensed with the early part of the business, at this point Assistant Provincial Grand Master David Randerson entered the lodge supported by Harry Cox, North Fylde Group Chairman Peter Greathead, North Fylde Group Vice Chairman John Cross and acting Provincial grand officers Jason Dell, John Pitches and Mike Winrow. David Randerson (left) presents John MacDonald with his certificate, watched by WM Alan Berwick (right). Alan formally welcomed David and offered him the gavel of the lodge which on this occasion he accepted. David asked Jason Dell to place John in a comfortable chair before him. David started his presentation by stating that John was born on 7 May 1935 at Lea Police Station near Preston, (John’s dad was a policeman), to John and Edith MacDonald. Sadly, John’s younger brother Frank died of rheumatic fever aged 10. John’s father originally trained as a baker in his hometown of Elgin in Morayshire before a recession forced him to move south to join the police force in Whitefield, Manchester. He was a keen golfer and became Lancashire Police Champion. A move to Colne saw him meet and marry Edith. In 1942 the family moved to Wigan where John started his education at Springview Junior School and then on to Hindley and Abram Grammar School. John’s sporting interests exceeded his academic ones and some of John’s fondest memories were as goalkeeper for the school first XI and after for local teams. David proceeded on to John’s adult years where his greatest desire was to join the Royal Navy which he did on 7 January 1952, aged 16 years and 8 months as an apprentice artificer. This was to be the start of a remarkable 24-year journey all around the world with John’s visit to Australia at the end of his career being one of his favourites. The destroyer HMS Diana was John’s first ship. John sailed to the Montebello Islands north of Australia where a British-Australian operation was going to test the effects of an atomic bomb. After the test HMS Diana was sent into the fallout area checking for levels of radioactivity which doesn’t really bear thinking about. After this, HMS Diana saw action in the Suez crisis when it torpedoed and sank the Egyptian frigate Domiat. Further transfers for John followed to HMS Girdleness in Malta and HMS Devonshire, the first guided missile destroyer which toured America and the West Indies. In 1966 John was were drafted onto HMS Tiger which famously hosted the Rhodesian talks between Harold Wilson and Ian Smith and John was in a team of four in Ian Smith’s party. Finally, in 1969 after his last trip to Australia, John retired as Chief Artificer whereupon he bought and ran the Norbreck Village Post Office and Stationers for 16 years before a second retirement. 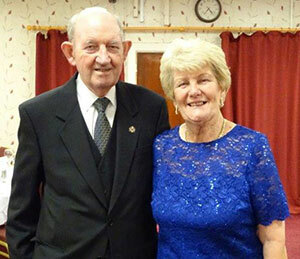 In between his tours of duty as a young sailor, John enjoyed dancing and regularly attended the Embassy Ballroom in Wigan and it was there John had the great fortune to meet and later marry his wonderful wife of 61 years, Mary. John has three children, Karen, Fiona and Grant, six grandchildren and one great grandchild. David then moved on to John’s Freemasonry. His father, grandfather and uncle were all Freemasons. John’s father was a past master of Borsdane Lodge No 6460 in Hindley and a Provincial officer and he was John’s proposer into that lodge. John was seconded by Dr C K Mackinnon. John was initiated on 8 January 1959 and passed in March of that year, but John’s raising took place in United Brethren Lodge No 1923 in Malta where he was stationed. John and Mary MacDonald (rear centre) together with friends. John’s links with Normoss Lodge, now the amalgamated Normoss Round Table Lodge No 8741 began when he was invited to its consecration in 1977 and then became one of six joining members along with Alan Tipper at the first regular meeting. John’s link to Borsdane Lodge have continued, which was evident by those brethren there to support his 60 years celebrations. John became master of Normoss Lodge in 1984 at Poulton with 83 brethren in attendance. In the intervening years John has served the lodge outstandingly as assistant director of ceremonies, director of ceremonies, assistant secretary, charity steward, almoner and auditor as well as being a member of Senatores Lodge of Installed Masters No 8966. 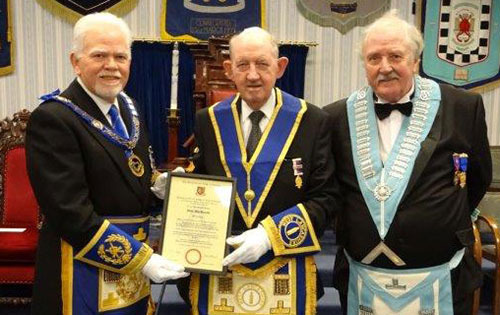 Provincial recognition for John’s hard work and dedication came in 1993 when he was appointed to Past Provincial Senior Grand Deacon and John’s further commitment brought promotion in 2001 to the very high rank of Past Provincial Junior Grand Warden. David Randerson, Peter Greathead, John Cross and Alan Berwick are joined by their partners. John joined the Royal Arch and was exalted into Anchorsholme Chapter No 5854 in 1978, became its first principal in 1990 and received a first Provincial appointment as Acting Provincial Grand Standard Bearer in 1996 and then promotion to Past Provincial Deputy Grand Sword Bearer in 2000. John also joined Senatores Chapter of Installed First Principals No 8966 in 1990. David rounded off his presentation by saying that 50 years was a remarkable achievement of continued dedicated service to two lodges, but now as John adds a 60th to his Masonic CV it is something rare and very special. David asked the North Fylde Group Chairman Peter Greathead to read the certificate which had come from the Provincial Grand Master Tony Harrison with his personal thanks and hearty greetings for John’s long service. David then presented the certificate to John. In a particularly moving end to the evening the festive board consisted of a ladies and gentlemen to dine. John was joined by his wife Mary to celebrate his diamond jubilee.